The Minister of Antiquities on Thursday assigned an archaeological committee from the Coptic and Islamic Antiquities Department to take all the necessary procedures to protect archaeological sites in Wadi El-Natroun from flooding. 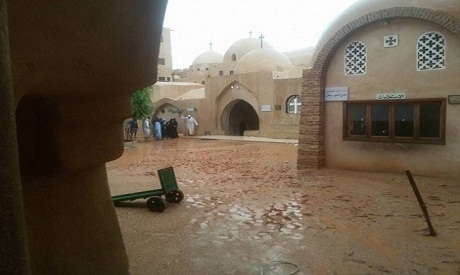 Abdel-Latif went on to say that the monasteries of Saint Macarius and Saint Pishoy are also still in a well-preserved condition and are safe. However, water leaked inside the church of Baramos monastery though it has been pumped out. He added that the walls are still wet. Water also leaked inside some archaeological sites in Alexandria and Rosetta as well as in north and south Sinai but has been pumped out from all the sites. Abdel Latif pointed out that the committee would take all the necessary procedures to protect the archaeological sites from the leakage of water as well as develop them so they are not threated by bad weather in the future.